Santa Clara Pueblo is located 26 miles north of Santa Fe, New Mexico. Santa Clara potters have been making a highly polished blackware, since the late 19th Century. Sara Fina Tafoya (1863-1949) is credited with developing the deep carving now characteristic of much Santa Clara pottery and which was carried on by her daughter Margaret. 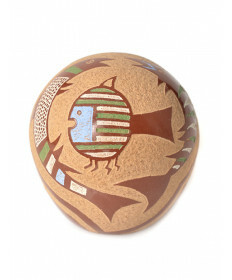 Potters at Santa Clara also make redware (carved and un-carved), polychrome buff and red ware and imaginative figurines. Unique to the polychrome redware is a blue-grey slip and the tradition of surrounding any applied color with a white line. 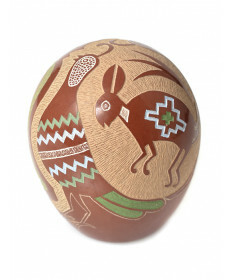 In addition, some artists, such as Joseph Lonewolf, Kevin Naranjo, Susan Folwell and Dolores Curran, have developed a highly detailed sgraffito decoration on the highly polished pot surface. 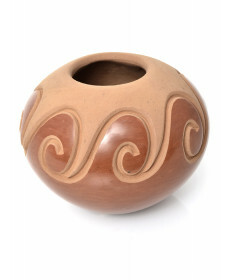 Colors in this style range from brown to red and brown and buff two-tone.